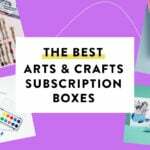 Smart Art is a fine arts subscription service that sends a curated box of supplies for a new project theme and featured artist every month. I enjoy doing art projects in my free time, so I’m excited for this subscription! Use code COLORJOY to save $5 off your first box! Use code MSA20 to save 20% off your first box! Good to know: It’s a different project in a different media every month, using different techniques! This month’s project was creating a flipbook! It’s been a while since I’ve drawn one (usually they were tiny doodles on sticky-note packs), so this month was a nice throwback. This is a booklet that Smart Art sends every month. It includes information about the featured project and artist, a list of descriptions of the included supplies, and project steps and illustrations. Subscribers can upload a picture of their finished projects to Smart Art’s Facebook page for a chance to win a free box, which is really cool! Page 2! This month’s art feature section introduces the history behind flipbook animation. Below, there are project pointers to keep in mind while completing. This month featured Faber-Castell products, so there was a detailed account of their PITT artist pens and benefits of India ink. Right below is a detailed list of the project tools, which include pencils, pens, an eraser, and a mini spiral sketchbook. The last page includes some basic steps to follow to complete the month’s project. *Please note that the values listed here are listed prices. Most of the supplies can be found for less at most online discount art supply stores. Here, I tried to show the thickness variations of the pencils (which came pre-sharpened!). 2H is the hardest and lightest, HB is your standard #2 wooden pencil, and 6B is the softest and darkest (among the given 6). The eraser works well, is soft, and does not ‘poop’ a lot. The eraser waste tends to gather in a single strand = easy cleanup! The fineliner pen (point size F) was a standard, black outlining pen. The brush pens (point size B) were pigmented and had slightly bendy brush tips. Before really using the brush pens, I looked up different methods and found many use them on marker paper (similar texture to the cover pages found in binder flaps) or use water to blend them. India inks are very pigmented, permanent, and are waterproof when dry, so you must work with them quickly to blend while the ink is drying. I tried blending (using my finger or a brush) and drawing into a wet spot. They were not as successful as I hoped, but you can use them like paint if you make a pool of the ink in a container and mix them with water. Here I experimented with layering the pen colors. Because the ink dries so quickly and is very permanent, it does not bleed when you overlap with a different color. You can also create nice layers to deepen the colors. This shows the big range of brush tip width you can use with the PITT artist pen. Here I layered the pencils– you can see the difference in boldness of color from 2H to 6B. As you go down the hardness scale, it becomes easier to layer because the lead is so soft. I then used the black fineliner to outline the eyes and used a small brush to create a tiny pink-red gradient, using the brush pen ink in 127 carmine. I used 167 olive for the eye color. Instead of water, I used alcohol to test whether the pigment would move and bleed, which I wanted, and it did very well! Here is the last page of the flipbook! I have to say, the extremely thick pages of the sketchbook made it difficult to quickly flip through, but I appreciated the nice texture and bleeding I created, without pilling of the paper. The Verdict: This was my first Smart Art box, and I think I’m a big fan! Though I’m not used to using such vibrant colors (as the PITT pens included), I had a fun time making the flipbook. The value this month was close, but a little low at $43.20 in a $50 box, even for a fine arts subscription box which tends to run low. I do think the experience and curation add to the value of the box, but that can be subjective. Can you still get this box if you sign up today? No, you will receive the February box. You must sign up by the last day of the month to get the following month’s curation! Sign up for February’s box here. Check out all of our Smart Art reviews and the Craft Subscription Box Directory! What did you think of Smart Art’s December project? What would you have created a flipbook of? How do subscribers rate Smart Art? Do you subscribe to Smart Art? Add your rating now! 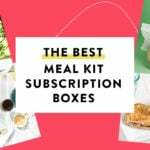 These products must be really impressive because my kids just begged me to get a subscription box and agreed to all sorts of things in order to earn it. Thank you for the review! What a great review. Thank you! And “eraser poop”? Lol. That’s a new one for me.